It's the age of smartphones and mobile data, where there are now apps gathering an immense amount of information about where we are, what stores we visit, and what we are doing. How do you make sense of all that data and actually help it to drive business decisions? Pasadena-based UberMedia (Www.ubermedia.com) is taking that data, and sorting through it to help businesses. We interviewed Gladys Kong, the CEO of UberMedia, to learn more about what the company is doing, and how it's using mobile location data to help companies with their business decisions. For those who aren't familiar with UberMedia and what it is doing today, tell us a bit about what your business is about now? 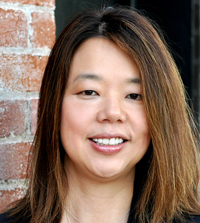 Gladys Kong: UberMedia today is an ad and technology solutions company. We take mobile behavior signals, and create actionable insights to power advertising, business intelligence, and measurement. Today, we do business with major brands and advertising agencies, including a lot of retail brands, providing them with business intelligence. We also work with companies doing measurement of marketing campaigns and store visits. How do you gather all of that mobile behavior information? Gladys Kong: As you know, we started out in mobile apps. We started out as a social media app developer in 2010, which gave us an opportunity to figure out how a powerful and rich data set would allow us to mine the interests and consumer behavior out of mobile signals. At the beginning, we were just collecting all of those data signals to improve the user experience on our app. Later, we learned that knowing that about a user helps with targeting in advertising, and how that can help improve business metrics and help you make better decisions. We started out as a social media apps company, and pivoted to mobile advertising, and now we are providing broader data and technology, not just for advertising, but also other business decisions. What kind of decisions and data are those businesses using? Gladys Kong: For instance, location data. Knowing the trend of how people move around the city can help make such decisions as what new types of stores you might want to open, where you might want to put a restaurant, to figure out what is a good site location to open up that new store, where there are opportunities, what kind of inventory to stock. We also have information so you can figure out if people tend to do do-it-yourself projects on a sunny day or rainy day, and different factors and movements and behavior on all sorts of level. Are those data points coming from your own apps, or other apps? Gladys Kong: It's coming from our own apps, plus the apps of our partners. When you look at advertising, some apps are sharing location information and what apps you are in. Gladys Kong: I think the biggest lesson we learned as a company, is that technology is only great if it applies to business and addresses some significant business need. You can build a great piece of technology, but unless it solves a problem for other companies, it doesn't matter. We learned a lot when we opened up our technology for advertising, and figured out what metrics matter to them, and what problems had not been solved. That was probably the biggest revelation for us early on. Online marketing has lots of tools to measure conversion, but it's very challenging for retailers to understand bad and good traffic. You've got to combine online marketing and offline measurement, to give brands more understanding of how their marketing spend is actually bringing people to their stores. I think we've solved the online and offline connection pretty well, using the data we have. What's next for you, in terms of goals? Gladys Kong: We are heading toward pushing our data to a broader range of businesses, to help those businesses understand how they can leverage mobile data to make better informed decisions. We're branching out from brands who have a typical online presence, to larger media companies or brands that don't exactly have an online marketing presence, but also need to measure in-store purchases and in other lines of business. We're focused on broadening the application of our mobile data.